Get your FREE Sample issue of Candis today! Calling all busy women! Whether you’re juggling parenthood, looking for the latest deals on the high street or want brilliant career advice - Candis magazine is the magazine for you! Every month, get ready to curl up with a magazine that offers you a one-stop shop for all the stuff that’s important to you. With informative, practical and insightful articles covering a large range of topics, you can be sure that you’ll learn something new every single month and keep ahead of the game. With brilliant advice on parenting and motherhood, plus recipes, health advice, competitions and more, you wouldn’t want to read anything else! Enjoy the best fashion and beauty advice from people in the know to make sure you’re always looking your best. Candis brings you the best high-street fashion and shows you where you can find catwalk-style items at affordable prices. Candis' fashion and beauty content is for real women who don’t have the time to slave away keeping up with trends but want to look fashionable for less. MAKE OUR: Fabulous Chocolate and Vanilla flower cake. If you’re a busy woman juggling parenthood, friendships, work-life balance and everything else, then Candis magazine is just the thing you need to introduce into your life. With no-nonsense articles covering all the important topics to you, you’ll be able to keep up with the world around you, all the latest fashion and beauty trends, and keep in the know about all things health, lifestyle and food. As well as fantastic articles showing you all the latest beauty tips and tricks, Candis magazine brings you delicious food recipes every month for you to try out at home. Create delicious meals for all the family to enjoy that will have people smiling for days! What’s more, every issue of Candis magazine gives you the amazing opportunity to win up to £6,500 worth of giveaways and competitions! 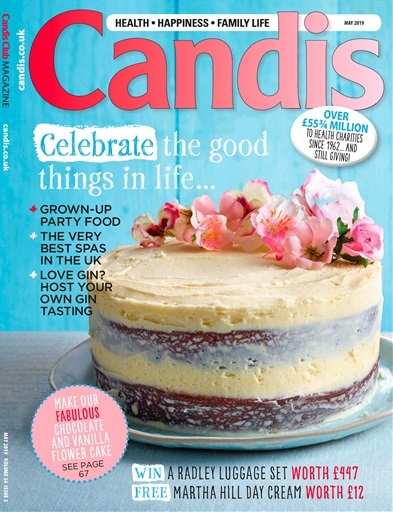 With so many great prizes up for grabs, you wouldn’t want to miss each issue of Candis magazine. Subscribe to Candis magazine today and get every issue delivered directly to your device before it hits the shops! The opportunity to win up to £6,500 worth of giveaways and prizes! You'll receive 12 issues during a 1 year Candis magazine subscription. You'll receive 12 issues during a 1 year Candis magazine print subscription.